Year after year, Cabernet Sauvignon is our top selling wine. 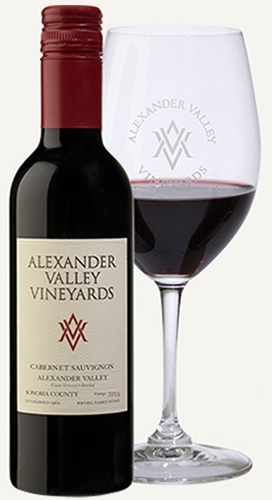 The 2016 Cabernet Sauvignon is a classic Alexander Valley wine with medium body, great fruit flavors and smooth, structured tannins. Winemaker Kevin Hall added 13% Merlot for structure, a touch of Cabernet Franc for floral notes and Malbec and Petit Verdot for color.There are aromas of black cherry, cassis, plum, slight blueberry, vanilla, oak and chocolate. In the glass there are rich flavors of cherry, cassis, blackberry and chocolate. This is a fruit forward wine with lush flavors, nice balance and a long, silky finish.